— The Gothic environs of 19th century Paris come to London in Andrew Lloyd Webber's haunting musical love story. 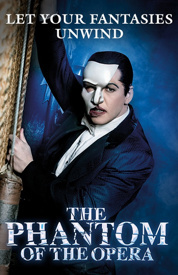 Andrew Lloyd Webber's masterwork is a timeless story of seduction and despair. Set at the Paris opera house, a beautiful soprano becomes the obsession of a mysterious, disfigured musical genius.